Food: Please bring a sack lunch. Snacks will be provided. Click here for a map/directions. Odyssey of the Mind will be located in Porter Hall on the Carnegie Mellon University Pittsburgh Campus. The entrance is from the Mall on the North-west corner of the building on the "A"-level. From Pittsburgh, follow 376 onto Forbes Ave to the Carnegie Mellon University campus. Parking is available in the East Campus Parking Garage on Forbes near Gesling Stadium. 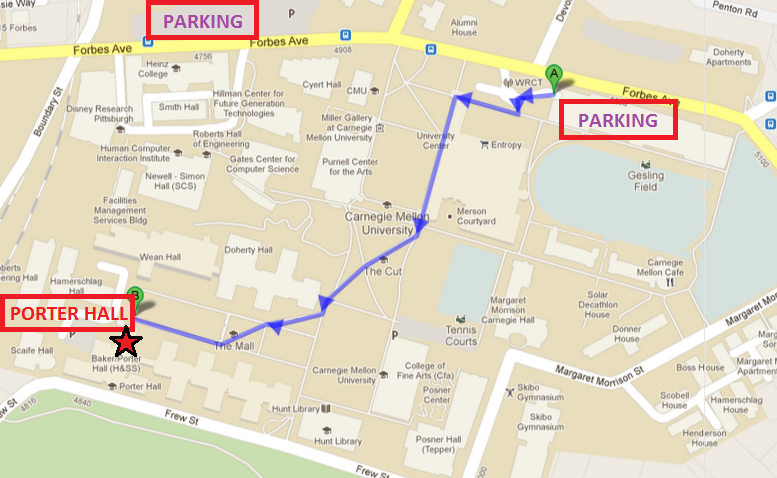 Additional parking is available in the Morewood Parking Lot to the North of Forbes Ave.
See the map below for parking locations and a walking route from the main parking garage to Porter Hall.